The lingering pop recipes of the mid-20th century haunt my Midwestern bloodline. I come from pea and peanut salad people, canned pears suspended in neon green Jell-O people. I grew up listening to stories around the dinner table, but I didn’t think about food critically until Laura Shapiro exploded (and expanded) my conception of my culinary heritage. Shapiro is, first and foremost in mind, an absolute baller. She’s a fastidious researcher with newsroom experience and more than a few books under her belt. She’s pushed her way into corporate archives, been up to her elbows in neglected texts and probably has spent too much time trying to decipher the hastily scribbled curlicues of some long-dead person’s handwriting. Shapiro knows her subjects so thoroughly that she is able to write history with grace and humor, a true feat considering many historians are great explainers albeit poor storytellers. She also writes about food, the people who make it and its significance. Fundamentally, she’s interested in the ordinary. I am too. In America we tell kids we should study history so that we don’t make the same mistakes twice. The truth, at least for me, is that we should study history to learn more about ourselves, the successes we depend upon and the mistakes we continue to make. 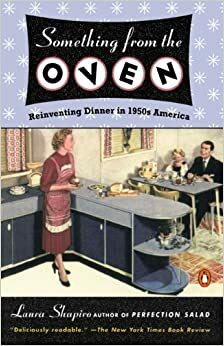 In the introduction to her second book, Something from the Oven (Penguin Books, 2005), Shapiro writes “In culinary history, the ordinary food of ordinary people is the great unknown.” The same is true throughout most of history. The extraordinary moments—losses, victories, revolutions, declarations—are championed and studied with a magnifying glass. The ordinary languishes. To consider the history of the ordinary, as Shapiro does, is to peel back a film of bias from your understanding of the world. It’s almost like putting on eyeglasses for the first time and having all the leaves on a tree come sharply into focus. The world was fine before—there was shape and color and utility—but now there is nuance and detail and a whole world rife with beauty. To see the veins of leaves and the texture of bark and the tangle of branches is to understand how something, like food, is fundamentally idiosyncratic and interconnected. I was seeing a forest before I read Shapiro for the first time, but then I saw maple and oak and birch. I was awestruck, grateful and insatiable. I listened to her. I didn’t need her permission to think for myself or to do my own research, but she spurred me forth. Now, as a PhD student, her work continues to remind me that I can write about ordinary people, what they cared about and what they ate with poise and style. Maybe where my blood is pea and peanut yours is shrimp and grits. We all eat. We are all human. Parts of all of us are ordinary. I think there’s tremendous pressure in our lives to seem spectacular and, in doing so, we let the everyday blend into the forest. In teaching ourselves to see, as Laura taught me, the landscape changes: it becomes clear that the ordinary is spectacular. Claire Bunschoten is a graduate student at the University of North Carolina-Chapel Hill pursuing a PhD in American Studies. She works primarily with culinary history, popular culture, national identity and consumption patterns. In addition to her academic work, she's written for national outlets like The Kitchn and Eaten and edits for cooknscribble.